Carrion, who met Brown when the two lived in the same Fordham Hill building in the early 1990s (Brown lived there until his death), said their families were close and they spent many vacations together over the years. 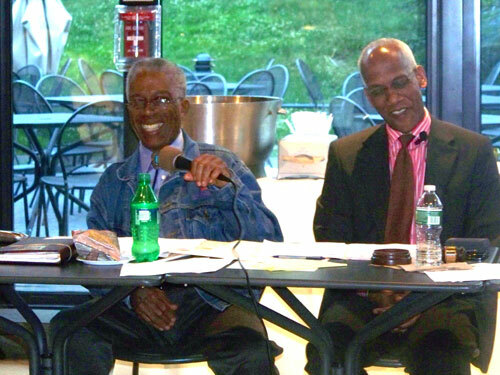 As borough president, Carrion appointed him to a Harlem River redevelopment task force and later to Community Board 7. Brown earned a reputation for offering extended, and often eloquent, speeches during board meetings and hearings. In recent years, he was in the middle of the board’s efforts to expand its role in the community and played a crucial role in shepherding several land use projects, including the re-zoning of Webster Avenue. (Brown said he envisioned the industrialized strip as a bustling commercial and residential area full of “cultural” destinations like galleries, restaurants and bookstores. )Over the past couple of years, Brown was instrumental in the board’s efforts to develop new leadership. Those efforts came to fruition earlier this year, when the board voted to install new people to chair each of its committees. Foster said developing youth leadership was important to Brown. “He was about showing young people that you have to get involved,” Foster said. Despite his penchant for lengthy monologues, Brown did not voluntarily offer up details about his own life, which, by all accounts, included deep bonds with famous and powerful people. While his credits include a few smaller films and television productions, the biggest film Brown worked on was the stellar documentary, “When We Were Kings,” which chronicled the epic 1974 heavyweight championship boxing match in Zaire between George Foreman and Muhammad Ali. His star-crossed history was on display in the summer of 2009 when Peter Yarrow, the musician (of Peter, Paul and Mary fame), peace activist and Brown’s good friend, showed up to offer his support and guitar-playing skills at a hearing on the redevelopment of the Kingsbridge Armory. In 2008, Brown’s friendship with Carrion was tested, Faulkner said, when the board was looking to hire a new district manager. At many boards, the district manager’s job is filled through political channels. But Faulkner had said publicly he would resign before giving in to political pressure. Despite his connection to Carrion, whose office was applying some “political heat,” Faulkner said Brown never wavered in his commitment to the board and its right to hire its own district manager. “That’s a tribute to Ozzie,” Faulkner said. Faulkner and Foster both said they will miss Brown’s optimism. “He always had a positive point of view,” Foster said. “Ozzie was like The Encourager,” Faulkner said. Whenever Faulkner would screw up or get discouraged, he said Brown would find the silver lining. “He would call you, randomly, and always upbeat, just to let you know how important you are and to give you encouragement,” he said. Brown is survived by his wife, Donna Anaman, as well as his sons, Hasan, Malik, and Ishaaq. The definition of a servant...Ozzie leaves an example of what it means to serve your community and we are all better because of his contribution to our society. Unheralded, humble, servant of the community who would trade in accolade for accomplishment any day of the week. He will be sorely missed. An inspiration for all of us young folks. RIP Mr. Brown.